Every now and then, a distant star called KIC 8462852 dims by as much as 20 percent. That’s huge. Even a passing planet as big as Jupiter would only block about 1 percent of the star’s light. Ruling out a planet, scientists have no idea what could be eclipsing the star (which is informally known as ‘Tabby’s Star’). The leading hypothesis is a family of really big comets, but that doesn’t quite fit. Astronomer Jason Wright pointed out that the light patterns are consistent with what we’d expect if aliens had built a Dyson swarm of solar collectors around the star to harness its energy. This hypothesis isn’t perfect either. The mystery deepened when astronomer Bradley Schaefer found evidence suggesting the star had also been dimming by about 16 percent each century. Such a huge drop in light over time made the comet hypothesis seem less likely. Compared to the 36 giant comets you’d need to create the star’s 20 percent dimming, you’d need 648,000 giant comets to explain the century-long dimming. Now a new paper calls Schaefer’s results into question. While there’s still no doubt that KIC 8462852 is a bizarre star, it’s going to take more research before we’ll know for sure whether the star is dimming over the long-term. Scientists are hinting at another paper that may soon come out and add to the debate. The current study, spearheaded by researchers at Vanderbilt University, suggests the centuries-long dimming may be the result of using different telescopes to collect the data. Both papers analyzed Harvard’s old astronomy plates, taken from a variety of telescopes that imaged the sky between the 1890s and the 1980s. Both teams measured the brightness of Tabby’s Star and others over time. The main differences lie in the analysis. While Schaefer found a downward trend in brightness–the result of drawing a single line through all the data points–the Vanderbilt study divided the data into two parts. In the specific case of KIC 8462852, the light curve is quite flat both before and after this data gap, and so its light curve appears to be better interpreted as the star having one brightness in the plates prior to 1962, and another brightness (slightly dimmer) after 1962. The star is consistent with no change in brightness from 1890 to 1962, and no change in brightness from 1962 to around 1990 (when the last plates were taken). This behavior (centered around this data gap) occurs for many of the comparison stars that we used. If the results hold up under scrutiny, it would mean that only 36 giant comets are needed to explain the star’s dimming behavior, making the alien hypothesis a little less tempting. Schaefer, though, is not confident in the Vanderbilt team’s data. “They have included stars and measures that no experienced person would use,” he told us in an email. He said he is also having a hard time verifying their data. Lots of telescopes, both amateur and professional, are now trained on star KIC 8462852, and their photometry data could indicate whether the star is dimming over the long-term. There are also other plate archives in other universities throughout the world that scientists will surely be sifting through in the coming years. The more scientists can learn about this star, the better. 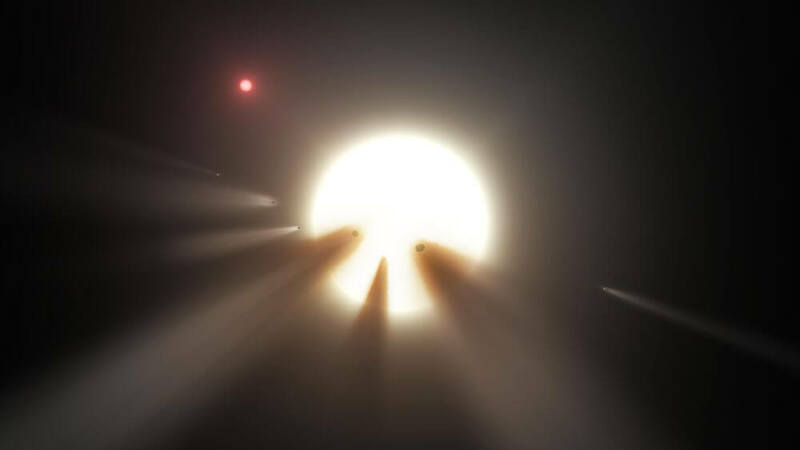 Both comets and an alien megastructure would be expected to produce extra infrared energy as they’re blocking out all that light, but astronomers can’t find evidence for that anywhere. Until they can come up with a better working hypothesis, KIC 8462852 will remain the most mysterious star in the universe.